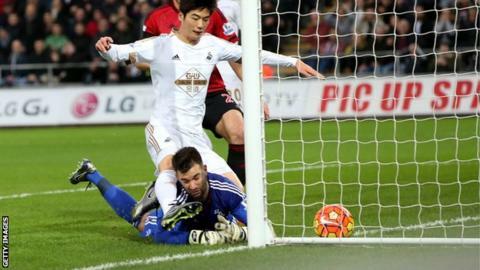 Swansea City midfielder Ki Sung-yueng has revealed he spent two days with ice on his face after suffering concussion against West Brom. The 27-year-old South Korean international was carried off on a stretcher during last week's 1-1 draw at the Hawthorns following a clash of heads with Albion's Stephane Sessegnon. Swansea confirmed Ki's concussion and, under FA guidelines, he had to sit out for at least six days before returning. "I felt really dizzy," Ki explained. The midfielder, capped 80-times by his country, missed Saturday's 1-1 home draw with Crystal Palace as a result of the injury, but is available for this weekend's home game against Southampton. "After the game I had a big headache for a few days, but I feel good now," Ki told the club's official website. "I tried to stop his shot and we both made contact with each other - it certainly wasn't intentional. "I had a few days of rest and I had ice on my face for two days, but now I'm back in training and ready to play this weekend." Swansea welcome Southampton to the Liberty Stadium on Saturday, four points above third-from-bottom Norwich. New head coach Francesco Guidolin has eased relegation fears by taking five points from his first three games in charge. But Ki admits there has been a sense of frustration after Swansea lost leads to draw against West Brom and Palace. "It's a big game for us because we should have won the last two games," Ki said. "We know three points would be a big boost for us. Home games are crucial."